Abstract: Many schools in China are now adopting 21st century,project-based, technology-embedded approaches to education. As with other nations, China recognizes the connection between innovative learning models and tomorrow’s global workforce. One illustration of this approach is a middle school in a congested Chinese city that features a 25-acre working farm. A robust, interdisciplinary STEAM based curriculum has been developed around The Farm. This convergence provides lessons for PBL, collaborative, authentic learning models that support the next generation of global citizens across the world. Biography: Michael Searson, Ph.D. and former president of the Society for Information Technology & Teacher Education(SITE), has been a professional educator for over forty years—from the K-12 classroom to higher education. At Kean University, Searson served in a number of positions, including executive director of the School for Global Education & Innovation. In 2012, he received the Outstanding Contributions to Excellence in Teacher Preparationaward from the New Jersey Secretary of Higher Education. Searson has also served in a number of statewide, national and international positions, including digital citizenship projects with UNESCOand UNICEF; membership on the US National Parks Service Advisory Board for Education; participant in the National Technology Leadership Summit; and, participationin several EduSummITs, held in The Hague, Paris, Washington DC, and Bangkok. Working with key technology organizations, he has served in leadership positions such as an Apple Distinguished Educator; participation in the Google Teaching Academy; recipient of a Facebook Digital Citizenship Research Grant; and, service on the Microsoft Partners in Learning Technology Enriched Instructionprogram. Over the years, Dr. Searson has authored or co-authored about $12 million in grants, often focusing on the integration of innovative learning technologies into student learning. Key grants have included Preparing Tomorrow’s Teachers for Technology(PT3), various Startalk: Hindi-Urdu Student and Teacher Languagegrants, the OnLine Teacher Preparation Program and Website for PBL Standards-Focusedproject. Over his career Dr. Searson has published and/or served as editor for over 150 articles, chapters and forewords in various publications. And, Searson has delivered keynotes and invited presentations—mostly focusing on technology integration and innovative pedagogies—across several continents. 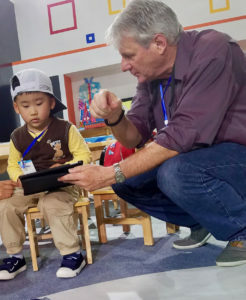 Searson has recently been appointed Vice President of the Shanghai Likeda Education Technology Group, which will focus on innovative integration of learning technology and meaningful pedagogies.